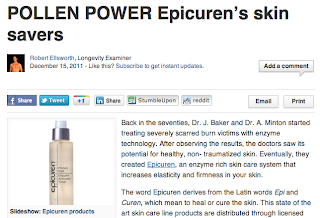 On Examiner.com Robert Ellsworth has a feature that reviews all of the benefits of using Epicuren's Protein Mist Enzyme Toner and Brazilian Propolis Lotion. Find the Examiner.com story here. Click here for more information on Epicuren's Protein Mist Enzyme Toner. Click here for more information on Epicuren's Brazilian Propolis Lotion.